At first I wanted the napkins. Anyone who has eaten a few meals at mid- or lower-end restaurants in China knows that getting table napkins can require the persistence and negotiating skills of a senior diplomat. You’d think the waitstaff were personally paying for each napkin out of their own paychecks (wait, maybe they are?) by the way they generally first ignore, then contest, your request for napkins. Eventually, if you’re patient, you might receive a single thin napkin. Use it wisely. Many restaurants charge for napkins—ask for canjinzhi and you’ll be told that a packet will cost you an additional renminbi or two (though at least you’ll probably have a few extra napkins in your pocket for next time). And slightly higher-end places might provide plastic-wrapped wet wipes or moist towels at each place setting—which will cost you several yuan the minute you rip open the wrapper. (As language students in Beijing back in 2005, my friends and I would immediately collect the packets as soon as we sat down in our favorite dumpling restaurant, return them to the waiter, and then pore over the messy handwritten bill at the end of the meal to ensure we hadn’t been charged for opening them.) One of the Chinese lessons I learned the fastest was to always have a pack of Kleenex in my bag and expect them to serve triple-duty as tissues, toilet paper, and napkins. Why the extreme napkin generosity, New York? Most of us could make do with two—okay, I’ll even go up to three—napkins during the course of a normal lunch (obviously, something like barbecued ribs requires many more). At any given meal, I receive at least double the number of paper napkins I need—paper napkins that cost money and require environmental resources to make. I’m guessing that some people, like me, save unused napkins and hold onto them for another time, but an equal number just toss the leftover napkins out with the rest of their trash. Still, it feels like I’m fighting a losing battle agains the paper napkin tide. They just keep showing up, and I just keep adding them to my collection. 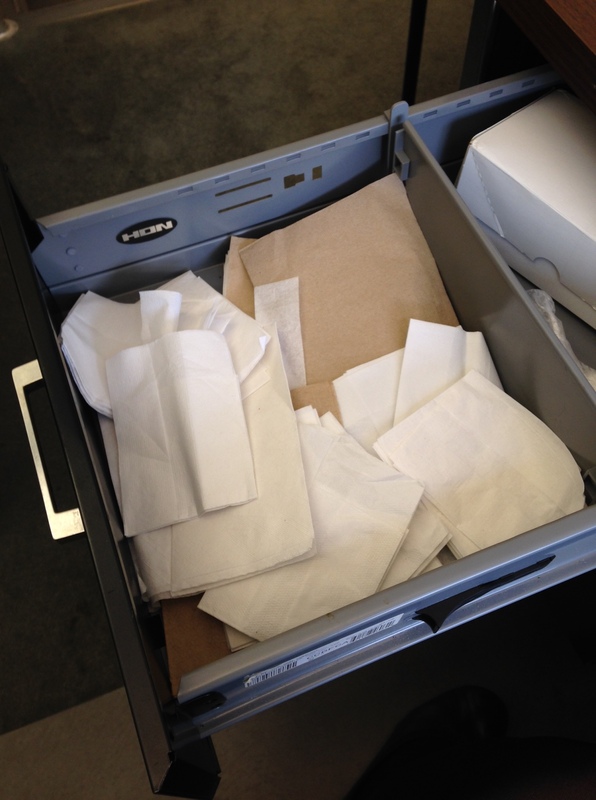 I’ve resigned myself to always having a glut of napkins. At least I’ll be ready for my next trip to China.